099. DE GERLACHE. Issued by J.F. Lehmann's Verlag München. (Date?). Unnumbered card from a set of unknown number. Size: Ca. 4" x 2.5". 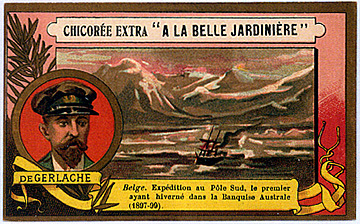 Recto: Portrait of de Gerlache at left with scene behind with icy mountains and ship. At the bottom: Belge. Expédition au Pôle Sud, le premier ayant hiverné dans la Banquise Australe (1897-99). Note: There is a variant of this card. The recto is the same except the wording at the top, rather than reading 'CHICORÉE EXTRA "A LA BELLE JARDINIÈRE' reads 'POIVRES SARAH THÉS SARAH | Ne se vendent qu'en paquets'. The verso is different as well but deals solely with the product so is not included here.